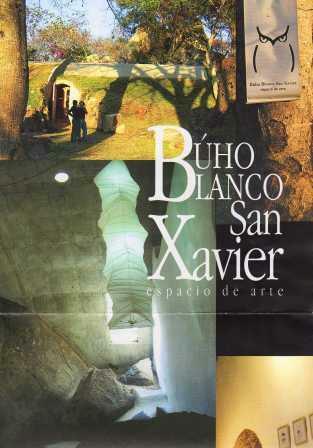 Buho Blanco Art Gallery. Juan Bustillos Bolivian Sculptor. Santa Cruz, Bolivia. The Buho Blanco is the private art gallery of Bolivian sculptor Juan Bustillos and is located in his home in the city of Santa Cruz, Bolivia. Click on his name to read more about his workshop and gallery in the city. You can read about my visit to his gallery and his amazing house which in itself is a work of art! This page is about the OTHER Buho Blanco. Yes there are two! Juan has established a beautiful Buho Blanco Art Gallery in the tiny Jesuit Mission town of San Javier, about 3 hours from Santa Cruz in the area known as the Chiquitos region of Bolivia where the Jesuits established a series of numerous churches and mission towns among the Guaraní populations of Bolivia in the 1600's and 1700's. There is an area in San Javier, just a few blocks from the center of the town, known as the Piedras Apóstoles, which is a group of gigantic granite rocks that protrude out of the surrounding lush vegetation. Here Juan created the second Buho Blanco, which is built to flow into the surrounding scenery and actually integrates some of the rocks into its structure. The most interesting thing about it is that it is semi-underground and looks like a huge cement tube with a grass roof. However, Juan at all times, even in his art, seeks harmony with nature and only uses natural elements in his work and buildings (with the exception of cement) so the building itself does not look incongruous or out of place at all in this environment. The structure is 140 m2 in size, and 80 m2 of this is a single gallery for exhibits. There is also a kitchen, bedroom and restrooms. The area surrounding the gallery is beautiful and you'll some of Juan's sculptures adorning the lawn and gardens. The gallery exhibits art pieces by national and foreign artists and artists can also do a residency, actually living in San Javier, while working and creating on the gallery premises. The gallery is not limited to residencies by painters and sculptors. Writers, photographers, and those involved in the theater arts are also welcome and encouraged to do residencies amid the lush landscape and quiet life of San Javier. For more information, contact Juan Bustillos by email using the secure form below. You can also call (591-3) 358-3902 and ask for Juan Bustillos directly. Don't miss a visit to this beautiful gallery. The Piedras Apóstoles are a "don't-miss" in San Javier either way. On weekends you might run into Juan himself and get a personal tour. He and his Japanese wife Yosuko often drive up to take a break from the noise of the city. This art gallery is open Tuesday through Sunday (closed Mondays) from about 9 am to about 5 pm. There are always attendants there to greet you and show you around. 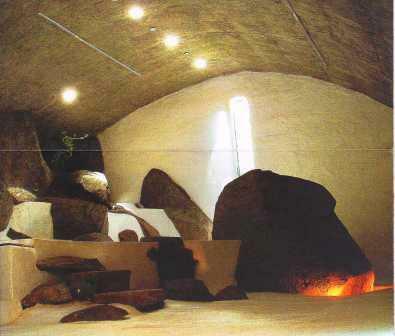 The Buho Blanco Gallery in San Javier is dedicated to Japanese sculptor Isamu Noguchi. Juan Bustillos is also one of three artists who joined to co-found the Manzana Uno Art Gallery in Santa Cruz.